Live blog on RTÉ.ie and the RTÉ News Now App from 12.30pm on Sunday. Live commentaries and updates on RTÉ Radio 1's Saturday Sport Extra from 6.55pm and on Sunday Sport from 2pm. Deferred showing of Tyrone v Mayo on TG4 from 3.45pm on Sunday. Highlights of all the weekend's action on Allianz League Sunday on RTÉ2 and the RTÉ Player on Sunday, 9.30pm. All live games also available on GAAGO. Sunday: Frost, fog and ice clearing gradually, with sunny spells through the morning. Cloud increasing from the Atlantic in the afternoon, with some light rain expected in coastal areas later. Staying cold, with highs of just 4 to 7 C, generally, but up to 7 or 8 C along Atlantic fringes. For more go to met.ie. Will the events on the last weekend in January have any bearing on what's to come when summer silverware is handed out? Probably not. Perhaps it's too loaded a question to ask at this time year but the opening weekend did give us a template upon which we can sketch out home some counties will fare in 2019. For that we should be grateful after a months of negativity about the state of the game. A hope for the season ahead is that people won't still be blathering on about how great Monaghan are despite their population size and the fact that so many of their players do not live within the county borders. I'm sure Paddy Kavanagh in that literary haven up above would scowl at such deference towards the Farney. Last weekend, after a slow start, Monaghan eventually found their bearings against the Dubs. A second victory in the space of ten months against Gavin's troops, and in truth there was a bit more to admire about how this Clones success came about. Drilling down further, there was much written and said about how Monaghan made good use of the offensive mark. In total, they claimed nine against the Dubs. They obviously spent much of the off season working on it and between them Conor McManus and the exciting youngster Stephen O'Hanlon put 2-03 on the Monaghan scorebard. It wasn't a case of hitting the high ball in, more the sight of forwards switching wings and leaving defenders in a state of bewilderment. Of course, those entrusted with minding the house, can also make a defensive mark and it will interesting to see if this is to the fore in the weeks ahead. In his column on these pages, Aidan O'Rourke believes the 'attacking mark' could, in time, make the game a better spectacle. "Essentially accurate kicking will be a potent weapon from the middle third," he said. "The key architects have to become quality kickers in the middle who can see and execute the creative pass any movement ahead requires in minimal space. "If the game evolves in that direction then a coveted clash of styles could become a feature of the game again and the traditionalists will have their poster teams to rally behind." Here's hoping O'Rourke is right and he summed up his thoughts when saying "If coaches and players can seize the opportunity that the offensive mark presents then we may see an acceleration of the evolution of our game towards a spectacle we will all be happier with." Monaghan reaped hay to some extent last Sunday and if other counties find a similar dividend in the next few weeks, there's a good chance it will get the green light for 2020 at the upcoming Congress. Tomás O'Se spoke about a real 'game changer' in the offing, even though his native county only claimed one mark in their league opener against Tyrone. Malachy O'Rourke is the first manager to have achieved back-to-back wins over a Dublin side managed by Jim Gavin. For Malachy O'Rourke's men, getting to the Division 1 decider is the obvious target. Indeed, lifting silverware on the steps of the Hogan Stand would now doubt heighten the feel-good factor even further, with one eye towards other days out at Croker come the summer. Another team who could do with a trophy lift at GAA HQ are Mayo. Conditions should be a lot kinder when they travel to Tyrone as to those they faced on their home patch against the Rossies. Debutant Brian Reape scored a cracker of a goal in that game. Only time will tell whether he can cement a place in the inside forward line. 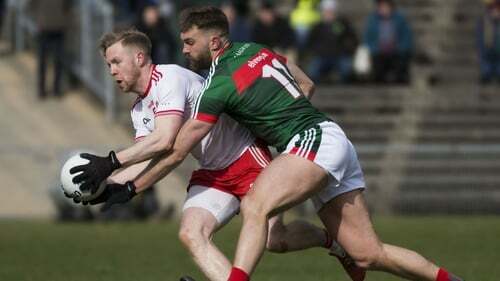 From number eight to 15 is where Mayo still need bolstering, at least according to Joe Brolly and Colm Cooper when they assessed the Green and Red on Allianz League Sunday. Brolly believes Aidan O'Shea is of no use playing out the field anymore and that number 14 is where he should now start. The 'Gooch' also had advice for James Horan as to where he should play Kevin McLoughlin. Laois' away win over Down signalled their intent of escaping from Division 3, while Westmeath's late rally to overhaul Offaly shows that they have the bottle that may see them escape from the same section. Yet, the top scorers after the opening round across the four divisions were Leitrim. With a strong second-half showing in Carrick, they left Wexford in their slipstream, scoring a total of 3-15. Picked out by many as a player to watch this year, Ryan O’Rourke was Wexford's tormentor in chief, as he notched up 2-07. There has been a positive vibe in the Connacht county since Terry Hyland's appointment, and the former Cavan is somewhat hopeful that Leitrim can achieve a long overdue promotion. Hew told the Leitrim Observer: "In one sense, no matter how you say, you are damned if you do and damned if you don’t. Of course we want to get promoted, that’s why we’re in the competition and that is why we are there and to deny that would mean that we should be where we are." "Whether that happens this year or not, I can’t answer that. I think if everything falls into place and goes well for us, I think it could happen this year." On Sunday, it's a trip to Aughrim to face a Wicklow side who also picked up both points on offer last weekend when edging out Waterford.